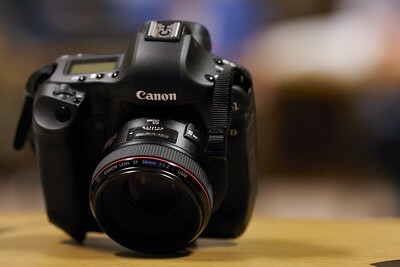 The recently announced and anticipated Canon EOS-1D Mark III was on hand at the March 2007 COBA meeting. Jim Rose, our local Canon Technical Rep, demoed the camera to a very eager crowd. I noticed a number of current 1D Mark II series owners, who no doubt came to check out the 10 fps, 10 megapixel camera for themselves. Nelse from Elite Flight Photography was especially interested in the high ISO capabilities of the Mark III. Paired with his 200/1.8 lens, a Mark III will give him more tools to achieve higher quality images in gymnasiums around the country. Jim commented that this is a ground-up revision to the 1D-series, not an evolutionary update like the Mark IIN was. I was more impressed with the Live View mode than I thought I would be. I can see it being extremely useful when doing any type of macro, landscape, or tripod-mounted photography. I will, however, have to get used to the new system for navigating the menus and for changing controls. I’ve gotten used to the press-and-hold method with the previous 1D-series, even going so far to say that I prefer it to the 20D/5D/Digital Rebel method. Change waits for no one, so I guess I will have to get used to the new method should I decide to pick up a Mark III. At the moment, I’m fine with the Mark II, though things might always change once the Mark III begins shipping. I could tell a number of COBA members will be getting ready to purchase one (or two) in the coming months. Others would prefer to wait for the successor to the 1Ds Mark III. There have been rumors that this camera will be a medium format competitor with a new (and backwards compatible) lens mount. Time will tell! Chris P. gave a great recap of his time at PMA in Las Vegas last week. The Photo Marketing Association holds one of the largest photo conventions in the world each year. Next week, photographers from all over will be returning to Vegas for the Wedding and Portrait Photographers International Convention. The conventions never stop in Vegas! I didn’t realize how big the Sigma 200-500mm f/2.8 lens truly was until I saw Chris’ photo from the conference. One thing’s for sure, you won’t be hand-holding that lens anytime soon;tThat thing is a beast at over 35 pounds! Following the two presentations, many COBA members stuck around to handle the Mark III and look over the monthly assignment photos. Only four people submitted entries for this month. Let’s try to triple that amount for next month! Any suggestions for the next assignment? I’ll be sending out a preliminary meeting notice early next week with details.